In the second half of the seventeenth century, the eruption occurred in 1669 and the catastrophic earthquake of 1693 which destroyed almost the entire city. The reconstruction work was carried out following the plan devised by Giuseppe Lanza, Duke of Camastra, which included "straight roads and wide," interspersed with squares within easy reach in case of an earthquake. Uzeda Thus were born the Way (via Etnea) and the Street Lanza (route Sangiuliano). The reconstruction of Catania attended Vaccarini architects such as John the Baptist, Jerome Mansion and Antonino Battaglia. First we Dusmet Street, passing through the doorway Uzeda (1), built in honor of the Spanish viceroy Paceco de Uzeda to arrive in Piazza Duomo (2), the real triumph of the baroque. On the left you can see the Palazzo dei Chierici (3) in front of the Municipal Palace (Palace of the Elephants 4) by the host Vaccarini inside the splendid carriages of the Senate. On the right is the Cathedral (5), enclosed by a fence adorned with marble statues created in the nineteenth century, rebuilt after the earthquake of 1669 on existing Terme Achilleiane. Inside it is divided into three naves of the Norman period and are held the relics of Saint Agatha, the tombs of Bellini, Cardinal Dusmet and Constance of Aragon. At the center of the square you can admire the Fountain of the Elephant (6) (1736) by the model of the similar work on Vaccarini Bernini elephant della Minerva in Rome, the synthesis of pagan and Christian culture. Made of volcanic stone and surmounted by an Egyptian obelisk from Syene, became a symbol of the city. Looking to the left than the Palazzo dei Chierici the fountain dell'Amenano (7), known as the Water o 'linzolu, which is the background of the colorful history of the Fish Market. River Amenano is represented by a young man who supports a cornucopia slope water. Continuing meet in Piazza Alonzo di Benedetto Fountain of the Seven Channels (8), the Gate of Charles V (9) and along Via Garibaldi arrives in Piazza Mazzini (10), surrounded by arcades where once took place on the weekly market. At the end of the street you can admire the Piazza Palestro dominated by Porta Garibaldi (11), listed as the fort, built in 1768 in lava and white limestone of Syracuse, topped by a phoenix (not an eagle) symbol of Catania repeatedly risen and blossomed from the ashes, was a gift for the marriage of Caroline of Austria and King Ferdinand IV. 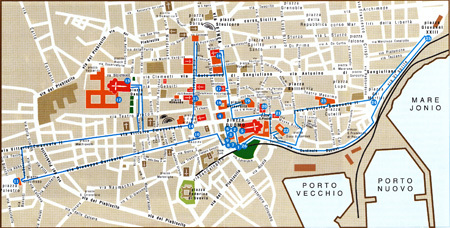 We exit on Via Vittorio Emanuele to Piazza del Risorgimento and Martyrs Square along which you can admire the various Baroque palaces. Arriving at Piazza Dante, where is the religious complex of the Benedictine Monastery (12) now houses the Faculty of Arts. Note the adjacent Church of San Nicolò l'Arena (13), one of the largest in Sicily. Returning on Via Vittorio Emanuele find Palazzo Gravina-Cruyllas, home to the Museo Bellini and Museo Emilio Greek, accessible from St. Francis where we see the monument to Cardinal Dusmet. Going beyond the Arch of St. Benedict arrives in Via Crociferi (15) where art triumphs of baroque buildings of religious order. We find in fact: the Church of St. Benedict, the Palace Asmundo Francica-Nava, the Church of St. Francis Borgia, Jesuit College (Institute of Art), the Church of San Giuliano, continuing the Monastery of the Fathers Crociferi Villa Cerami (Faculty of Law). Back on Way Sangiuliano on Via Etnea and Piazza Stesicoro to admire the Church of the child (16). Going to the Dome but it comes at University Square with the same name in front of the Palace and the Palace of Sangiuliano (19). Returning to Via Vittorio Emanuele are other examples of Baroque: The Badia di Sant'Agata (20) and the building dell'Arcivescovado. In Piazza San Placido visiting the church dedicated to him (21) and the former convent with a compulsory stop at the Palais des Platamone and the terrace of the Palazzo Biscari (22). 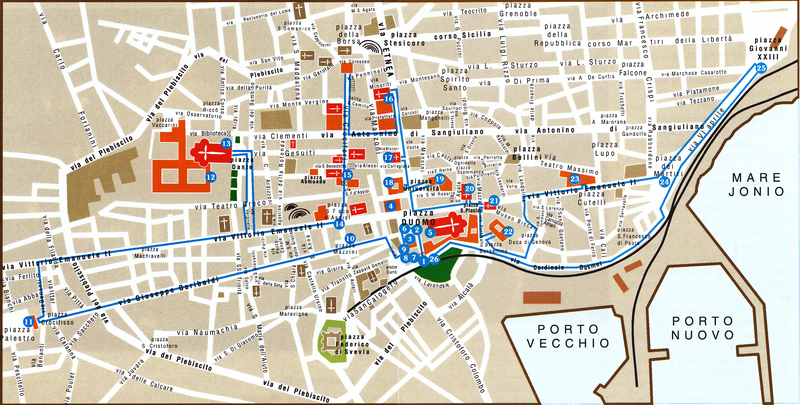 In the final stretch of the road to remember Piazza Cutelli with boarding (23) and the Martyrs' Square (24). Finally, we skirt the arches of the Navy to return to port Uzeda (26), our starting point.